Most golfers that hit a lot of fat shots also hit the ball thin or top the golf ball a lot of the time as well. Now, it might seem that a fat shot and a thin shot are at opposite ends of the spectrum, but in fact they are usually caused by the same fault… poor body weight transfer. 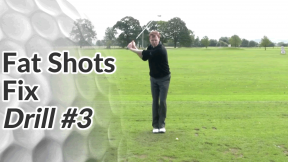 In the video below I explain why that’s the case and how you can use one of my favourite drills to correct both fat shots AND thin / top shots. A lot of fat or heavy shots are caused by poor body weight transfer. This is one of the best drills for helping you to transfer your body weight correctly into impact. Although hitting the ball fat and hitting the ball thin (or topping it) may seem very different faults, they both have similar causes. Master this drill and you’ll cut both fat and thin shots out of your game. Place the golf ball level with your little toe of your left (front) foot. This may seem extreme but it is a great way of feeling how your body weight can shift to the left side during your downswing. You may want to start by taking some practice swings into this area then maybe hit the ball from a small tee peg, but eventually try to remove the tee peg and strike the ball off the turf with a clean contact. 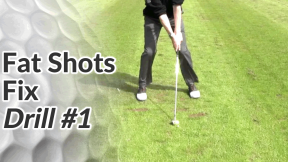 The first drill is more of a test to see how fat or heavy your golf shots are. 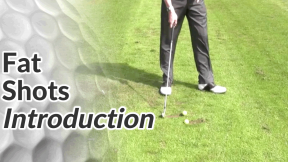 The second drill is a little more advanced and very useful for better players to really sharpen up their ball striking.